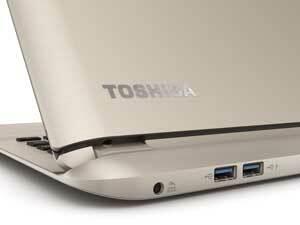 Toshiba Satellite Click 2 Pro P30W 13.3" Core i5 Laptop Intel 4210U, 8GB, 128GB. The Satellite Click 2 Pro P30W features a satin gold finish. With the detachable two-in-one Satellite Click 2 Pro P30W-B, you can choose between a fully-featured Ultrabook and a media-savvy tablet -- all in one flexible device. 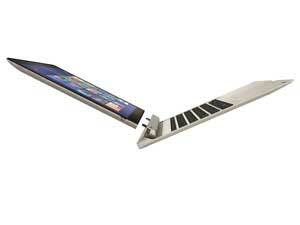 Simply attach or detach the illuminated tile frameless keyboard, for the freedom to move seamlessly between modes. On the one hand, you have the premium performance of an ultra thin, light and responsive Ultrabook to help you power through multiple tasks with ease. On the other hand, you have the added convenience of a fully-connected tablet that brings out every brilliant detail of your movies, games and more on the 33.8 cm (13.3-inch) Full HD IPS touchscreen display. The P30W-B is accelerated by Intel Core i5 for Ultrabook processors, and boosted by the speed you get from Intel Turbo Boost technology. It defines sophistication -- from the sleek brushed aluminium casing right through to the premium features inside. Experience the freedom of choice with the Satellite Click 2 Pro P30W-B. 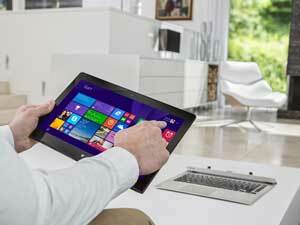 Ultrabook or tablet? With the flexible Satellite Click 2 Pro P30W-B, the choice is easy to make. Transition seamlessly from a high-performance laptop to a fully-connected tablet with just a click. Detachable and versatile, the ultra sleek Satellite Click 2 Pro P30W-B defines sophistication. This high-quality device is super slim, light to carry and easy to use and with its brushed aluminium chassis will leave a lasting impression. With an Intel Core i5 for Ultrabook processor inside, you can power through multiple tasks effortlessly, be amazed by eye-popping visuals and enjoy lightning-fast access to all your files and applications. You can also experience your content at more accelerated speeds, thanks to the burst of power that comes from Intel Turbo Boost technology 2.0, and the reliable 128 GB SSD is super fast too. Whatever you want to see or do, the Satellite Click 2 Pro P30W-B delivers it to you smoothly, seamlessly and in an instant -- while making the most of a battery life that keeps up with you virtually all day long. Slim and lightweight, the Satellite Click 2 Pro P30W is the ideal mobile companion. 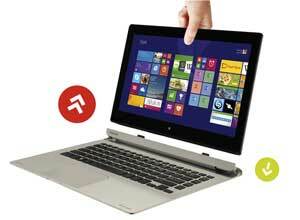 In either mode, the P30W offers you a responsive touchscreen experience -- ideal for Windows 8.1. Not only does this two-in-one detachable device give you complete freedom of choice, it was made to synchronise with you. You're in full control whether you want to use the keyboard to create content, or navigate the Full HD 33.8 cm (13.3-inch) screen instinctively, by touch. Or use the IPS wide viewing angle display to view your content from various seating positions, in all its clear, bright Full HD detail. With 10-finger touchscreen support, you can interact with your applications and games more intuitively, using all of your fingers -- and get the most out of Windows 8.1 too. The touchscreen is simple to use, and responds to natural human gestures, such as slide, flip, open, zoom, turn and tilt. Thanks to Harman Kardon stereo speakers, you get a premium sound experience -- whether you're using your Satellite Click 2 Pro P30W-B in laptop or tablet mode. The speakers are also tuned with DTS Sound -- an audio-enhancement suite that boosts volume, enhances bass and improves definition. This means you can fully immerse yourself in virtual surround sound, and enjoy your music and films in rich quality with crystal-clear detail. With a full selection of ports and slots to keep you connected -- whether you're using the P30W-B as an Ultrabook or as a tablet. Most ports are full-size too, so you won't need to carry any special adapters to connect to your other devices. The keyboard has two full-size USB 3.0 ports for fast data transfer, a full-size SD card slot and a full-size HDMI port with UHD 4K support. The tablet is completely independent too -- leaving you free to connect via a full-size USB 2.0 port, a micro-HDMI port supporting UHD 4K, and a micro-SD slot. One USB 3.0 port also supports USB Sleep-and-Charge technology, so even if the device is switched off, you can still charge your smartphone and MP3 player. Featuring DTS Sound tuned by Harman Kardon, the Satellite Click 2 Pro P30W gives you great audio without the need for external speakers. 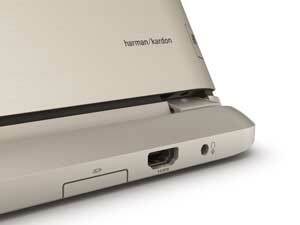 No buttons or catches required -- simply push down on the P30W-B screen to quickly and easily release the tablet. The Toshiba Satellite P30W-B has an integrated HDMI port on the keyboard and a micro-HDMI port on the tablet for added convenience and enhanced usability. You can connect your laptop or tablet to an external device and stream high definition content. When using HDMI, audio and visual content are streamed through a single cable, removing the need for multiple connections. You only need one cable, making connecting your laptop easier and tidier. The Satellite Click 2 Pro P30W-B features a HD front-facing camera for talking face-to-face with colleagues and friends. It's just as easy to share your world with everyone in crisp, clear detail thanks to the image quality of the 5 MP Full HD auto-focus rear-facing camera. Add to that dual noise-cancelling stereo mics, and you can rely on rich, defined communications that get every action and sound across. The Satellite Click 2 Pro P30W-B also supports Wi-Fi '802.11ac' standard and comes with built-in Bluetooth -- plus you can stream content wirelessly to your big screen HD TV with wireless display technologies including Intel WiDi.